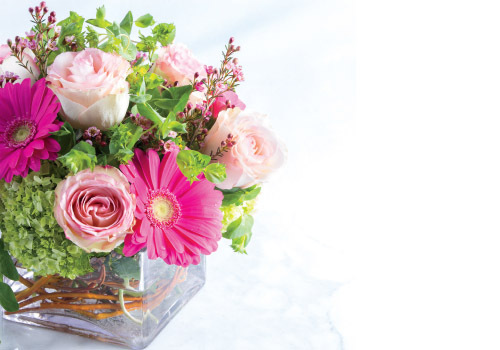 Add a burst of color to your spring celebrations with your own flower arrangement. Here is a handy guide to help you dress up your table with warm thoughts of the season using curly willow, green mini hydrangeas, gerbera daisies, roses and light touches of foliage with accents of wax flower. 1. Use a vase that’s been washed with hot, soapy water and thoroughly rinsed to eliminate any bacteria. To preserve the life of the flowers, add a packet of flower preservative to the vase, and then add fresh water according to the directions on the packet. The temperature of the water should be close to room temperature. 2. Begin by placing curly willow into the interior of the vase. This step will create a grid to help hold the flowers in place. 3. Add the green mini hydrangeas. Cut the stem and then scrape it gently so it will draw water easier, allowing the flowers to continue to open and giving them extra life. Place the mini hydrangeas closer to the top of the vase to create depth. 4. Cut the stems of gerbera daisies using a clean knife or pair of snips, leaving enough of the stem attached so the flowers sit about an inch and a half above the top of the vase. This flower is delicate so be careful not to break the bloom when adding it into your design. Place the cut stem in water as quickly as possible to prevent air from entering the stems. Use this as the dominant flower for your arrangement. A quick tip to remember is to use an odd number of each flower variety in your arrangement. 5. Add the roses. These will continue to open, so keep this in mind when placing them in your design. 6. Add touches of mixed foliage and wax flower to finish the arrangement. Remember balance of color, size and shape of your design are all important elements.